It seems incredible now to think back to the time when I first interviewed Paul Gardner, fourth generation paper seller and proprietor of Spitalfields’ oldest family business. Although I knew at once that Gardners’ Market Sundriesmen was an extraordinary endeavour, supplying cheap paper bags to the smallest businesses and traders in the East End for over a century, I could never have recognised the outcome of writing the story of it. Paul Gardner was being faced with an excessive rent increase at the time which threatened to put him out of business, yet the public expression of support was such that the landlord relented and the point was made – that small proprietor-owned businesses like this are the essence of the East End. If property pieces have gone up and multiples choose to come here, it is because of the distinctive appeal of businesses like Gardners. And, in the hundreds of features that I have written since then about the small tradesmen, market traders and independent shops, it became obvious that the potential existed for them come together to find a collective voice, asserting their importance and working collaboratively to ensure their survival. Community organiser Krissie Nicolson spoke with Paul Gardner and some other traders, arranging meetings at the Bishopsgate Institute throughout the last year at which people met to pool ideas. Attending these gatherings, it was fascinating to observe the notion take flight and observe new members arriving at every meeting bringing new energy, until this autumn it was obvious that the Guild had acquired its own momentum. And already, membership badges have started going up in shop windows around the East End announcing the presence of the Guild. The culmination of this process is the event on 19th November which constitutes the founding of The East End Trades Guild as a new co-operative of small independent traders working together in the interests of all proprietor-owned-and-run-businesses in the East End. The ceremony will commence at 7pm sharp with a trumpet fanfare for The East End Trades Guild by Tim Davy accompanied by a presentation of photographic portraits of all the founding members, followed by the premiere of a film by Sebastian Sharples entitled “We Are the Beating Heart of the East End” featuring the traders and celebrating the infinite variety of small businesses in the East End. If you are a trader and you would like to join the East End Trades Guild, please email krissie@eastendtradesguild.org.uk Members of the public are invited to attend to be witnesses to the founding of the Guild – please arrive at 6:30pm. Calling all brass players! We need you to help launch the EAST END TRADES GUILD on Monday 19th November. Tim Davy will be creating a fanfare with as many brass players as possible to announce the founding of the Guild. All brass players are welcome that can read music. Email spitalfieldsbrass@gmail.com to sign up, giving information about your level of experience, and be prepared to come to the rehearsal at 5pm on Monday 19th November at Christ Church, Spitalfields, ready for the performance at 7pm. 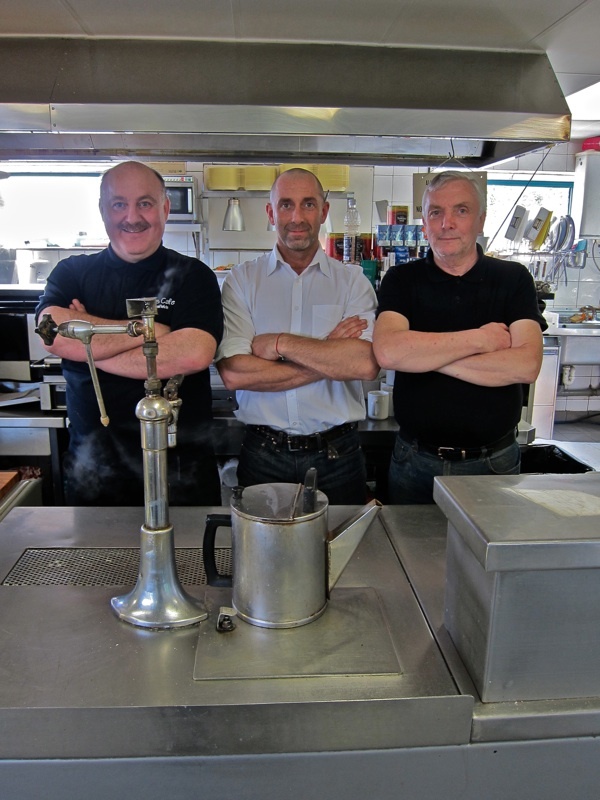 THE EAST END TRADES GUILD is a co-operative of small independent traders working together in the interests of all proprietor-owned-and-run-businesses in the East End. As well as offering goods and services, and creating employment for local people, our members provide social spaces that sustain relationships between residents – building stronger communities and making our streets safer and better places to be. We carry the history of this place which has always been characterised by the culture of small traders and family businesses who know their customers personally. Vital both to the local economy and to the life of community, it is the infinite variety of small traders that make the East End such an appealing destination, adding value to property and attracting other businesses. In the past, these truths have been ignored and exploited by landlords, their agents, big business and government. Yet small businesses are the starting point for social and economic innovation, aligning commerce with the common good and bringing a human face to the marketplace. Speaking in unity, at this time of economic crisis, we demand recognition for small traders, asserting their central importance to the economy and advocating their interests to achieve a better deal for our members. What does THE EAST END TRADES GUILD do? We develop campaigns based on the issues that are important to our members. We provide a voice for small business to influence government policy at local and national levels. We create networking and promotional opportunities for members at our meetings and through our website. We offer advice to members on rent reviews and contracts. We pursue initiatives that build our local economy, keeping money here and creating jobs for local people. OUR MISSION is to bring the traders of the East End together to speak with one voice, harnessing public support and educating policy makers on the economic, social and cultural value that independent businesses bring to our communities. By working together, we aim to support our local economy to thrive and grow. Oh, Gentle Author… you should be so proud of what you have helped create. I bet I will be able to hear that fanfare all the way to Canada! The passion in your postings often make me cry- this one sure did. Thank you. i am really thrilled. small is beautiful. if you made badges of the brown logo i’d be happy to swagger through the streets of albuquerque, new mexico, wearing it. Congratulations all round, I wish you every success in the world. Fantastic! The small businesses need to survive to help retain the unique character of Spitalfields and the east end. Congratulations and good luck. I work in a primary school in The East End just near Brick Lane and we have been learning about community, beliefs and belonging. In my lessons I have used so many of your blogs and recommendations, and just now, I showed the clip for the Guild. As many of their parents are traders, this was another wonderful way to show the children that they need not just be defined by race, gender or ethinity, but everyone working together and being a part of the real East End community. Thank you so much! Well done GA! You and Spitalfields Life really are the beating heart of the East End. Boris Johnson won’t be happy until the whole of London is one air-conditioned, security-patrolled atrium. When will he learn it’s not all about money. There’s only so much land, there’s only so much that can be made from it. People don’t some from far and wide to visit London and look at the front of a new bank. A result! And a brilliant one too. Well done you – and I love the stickers. I agree with Jeannette and others that this is your finest hour. 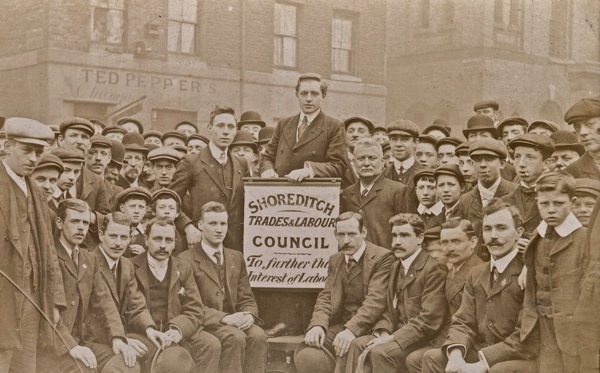 And while I love the photo of the Shoreditch Trades and Labour Council, I wonder about the missing ladies. Historical photos like this frequently only show part of the story. When the EETG is fully formed, it would be wonderful to do a modern photo with all the men and women who join. I’m afraid there wouldn’t have been any women in those guilds Isis. Trades Councils started as part of the early trades union movement and the kind of workers they represented, unfortunately, were in professions where women didn’t get much of a look in. It wasn’t until the match girls of Bow united and struck that unions for unskilled workers (and women) were even considered as a notion, but they were to inspire many others – especially the dockers whose own strike is mentioned on Adam Dant’s map close by. Isis, be assured that we shall taking our own group photograph at the launch which will reveal the composition of the new Guild. I wish you independent traders much success. As someone who needs to rent a property in order to work I was interested a while back to read in one of the broadsheets that in Paris there exists a cap on business rents as a way of ensuring the survival of small businesses, and thereby preserving the unique quality of the city. Don’t know if that remains the case but it is the continual increase in rents here that create a major problem for small businesses. It is unbelievable short sightedness on the part of those in power to allow this crushing of people with such get up and go.